We had a gorgeous Memorial Weekend in Seattle. Which was very surprising to all, since apparently it’s been thirty years since the last time all three days of the weekend were sunny. Because it was such a beautiful weekend, I hardly did any knitting. 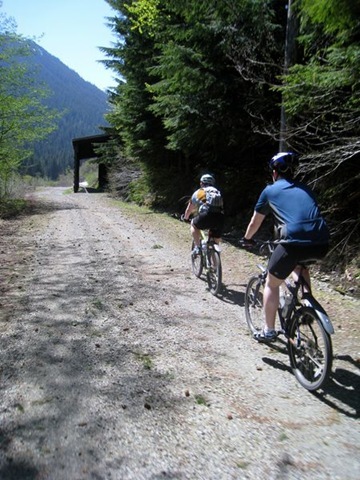 But yesterday we went on a great bike ride on the Iron Horse trail (an old railroad) in the Snoqualmie-Baker National Forest. We bike on this trail a lot, but we usually stick to the first ten or twenty miles. 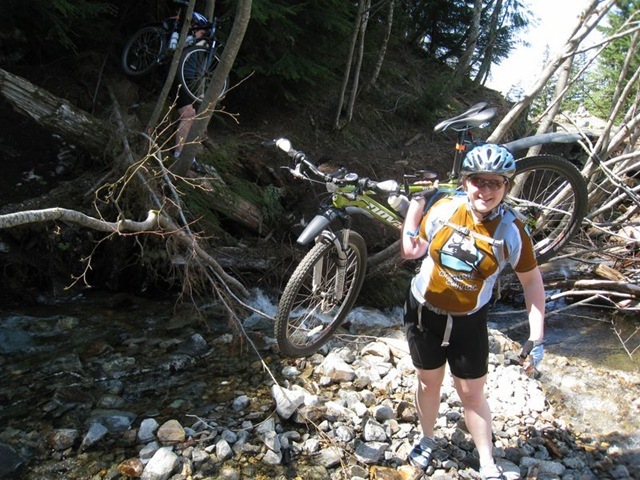 This time we started the ride where we normally turn around and went to the “end” of the trail. 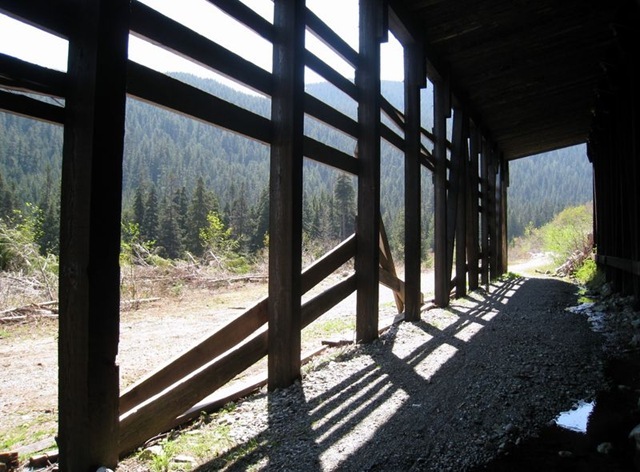 Now, this trail goes all the way to Spokane and normally you have to go through a mile-and-a-half long old railroad tunnel to get through Snoqualmie Pass. 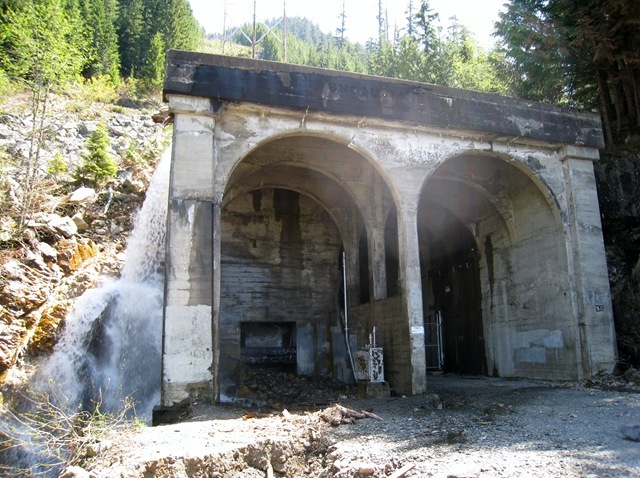 This winter the tunnel sustained some damage from the weather, so the tunnel is closed for a while, thus making the tunnel entrance essentially the end of the trail for us right now. We could drive over the pass and continue from the other side, but that’s not really a continuous ride anymore. Anyway, we had quite the adventure! 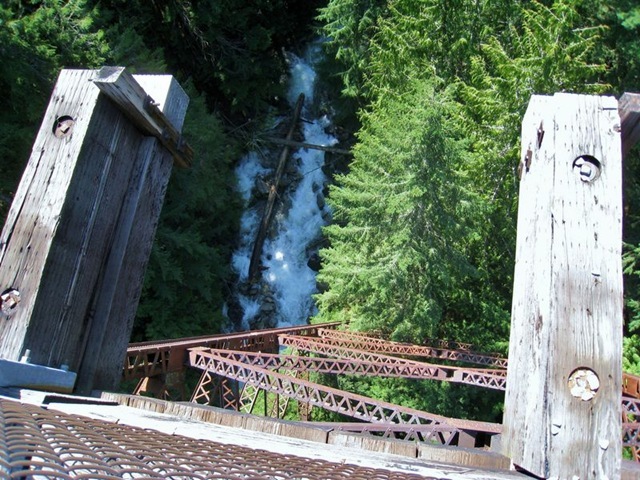 We rode over a great trestle bridge over Hansen Creek. We saw an old snow shed that protected the tracks in case of avalanche. Not so much a “dip” as it is a giant devastated washout. That used to be a railroad tie and concrete bridge. 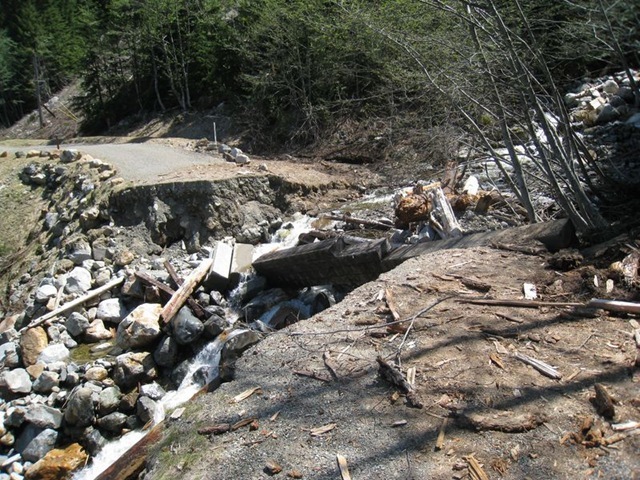 That creek must have been running with a Biblical amount of water to destroy the bridge! However, we were not to be deterred. We are brave (and sometimes foolhardy) explorers. I will say that it would have been a lot easier if I hadn’t had the bike. Getting to this part of the stream was the hardest. There were very few good places to step around those logs. Oh, and that’s not dirt on the cliff behind me- that’s snow covered in dirt. That was, er, fun to walk across. That water is snow-melt. And it came up to mid-calf. Then we reached the tunnel, which was pretty cool. There was water falling off the top. Then we headed back, satisfied in our adventure. 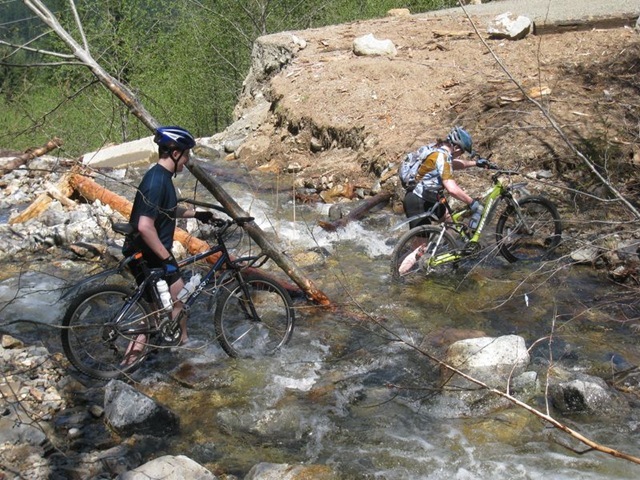 We forded the stream again, climbed back up the dirty snow-cliff and biked onward. And then we saw the bear. He was pretty small, so he must have just left his mother. 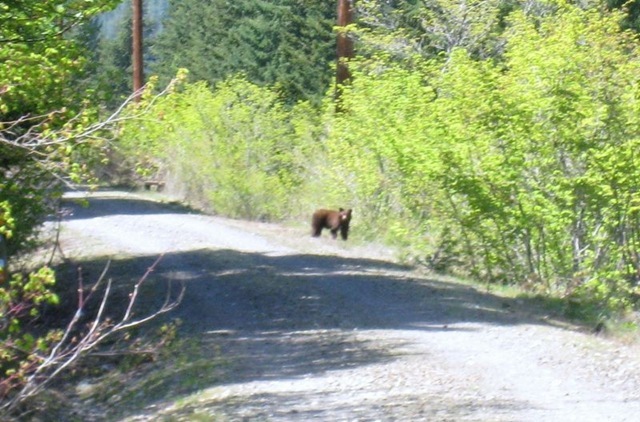 This is the third bear we’ve seen on the trail and the second this year! I know he’s brown, but he’s actually a black bear. We don’t really have grizzlies in this area. Black bears are much more common. All in all, a pretty good Memorial Day. I am, of this moment, at the Starbucks at the top of the hill, very politely stealing their power. See, my house has no power. Because the river near our house has come seeking my soul. It got a taste for my blood this summer when I fell out of my kayak and now it’s back for more! Well, ok, maybe the flood has more to do with the massive amount of rain and the warm temperatures that are melting the snow in the mountains. Maybe. But I’m unconvinced. I think it’s coming for me. 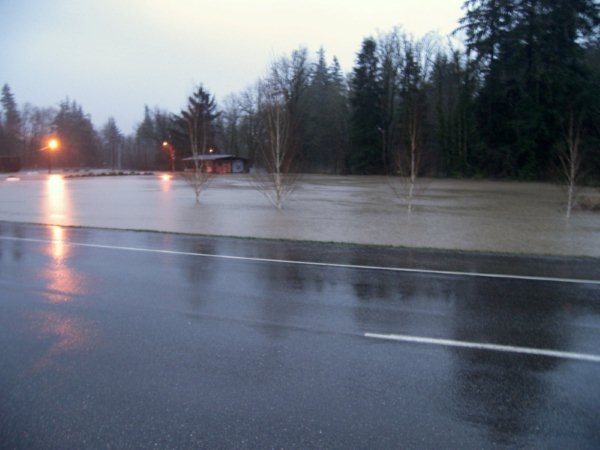 My house is really in no danger from the flooding, except that it’s knocked out our power. We’re up a pretty big hill. But the river is definitely flooding higher than it has before (it flooded a couple years ago, also knocking out our power.) I hear we’re on the national news, even. 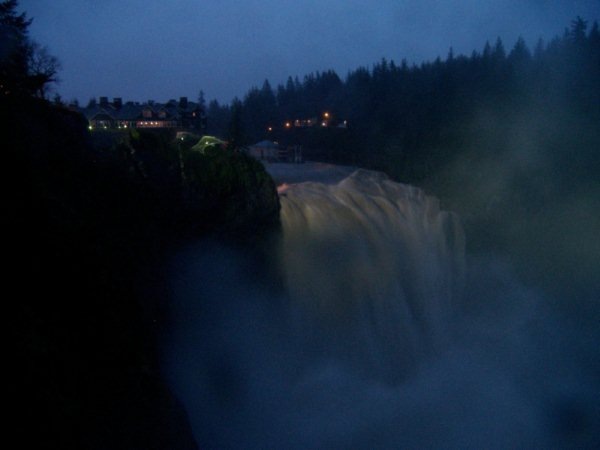 To give you an idea about the amount of water coming through my town, these are the Snoqualmie Falls. 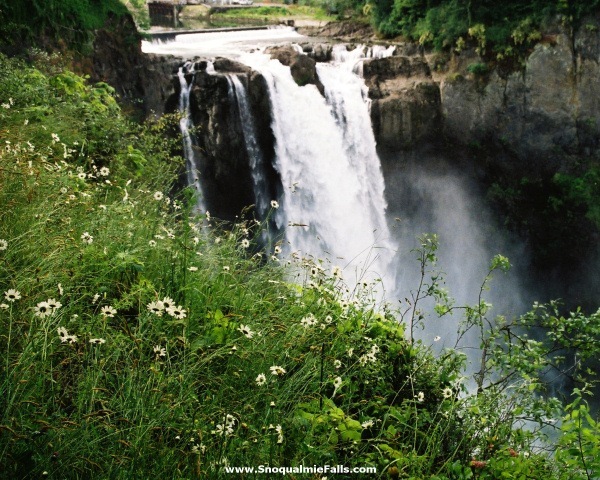 A lovely waterfall and tourist attraction that we often take people too. The falls are about 300 feet tall. 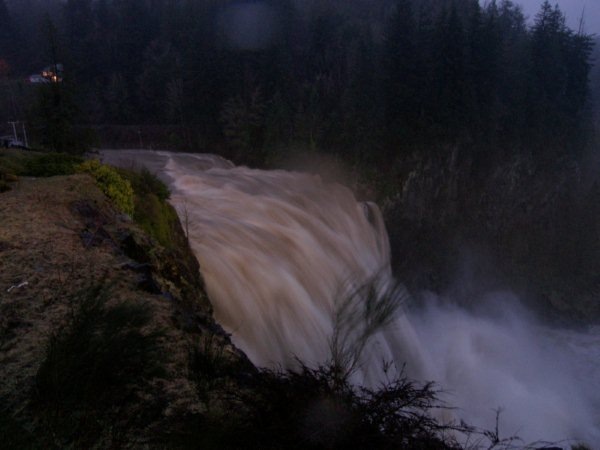 And this is Snoqualmie Falls yesterday. You can even see the few tree that are left over floating on the left side. Before the power outage, I was in the process of making PDFs of all my patterns for easier printing. (Thanks for prompting me, ChristyH!) I’ve finally found a program that does everything I want without all the things I don’t care about. I’ll write more about that next time… hopefully without having to walk to the Starbucks to do so.